For many years, the Apple iPad Pro tablet sets the bar high for other tablets to meet. Despite the fact that there are other popular tablet models in the market, people still regard the Apple iPad Pro tablet as the one with promising performance. 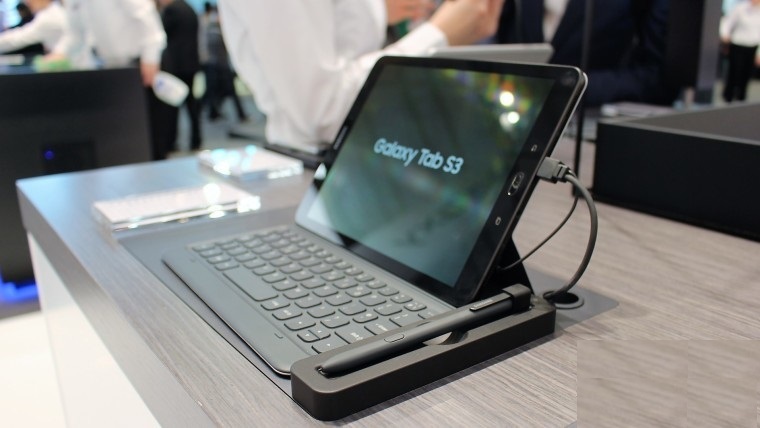 However, there is a new contender that can break its dominance - the new Samsung Galaxy Tab S3 9.7 tablet. It emerges as the best Android tablet to date. 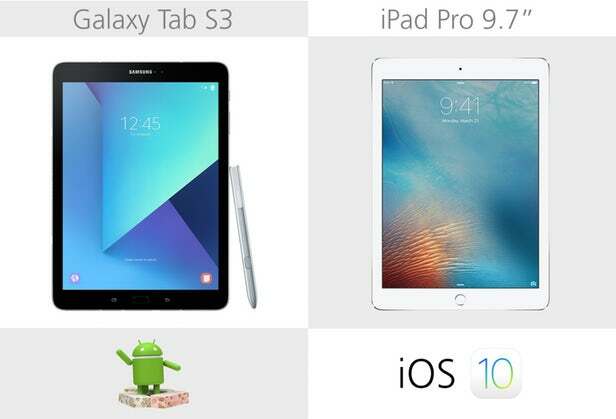 Some reviewers even go as far as to claim that it is Android's first worthy competitor to Apple iPad Pro 9.7. 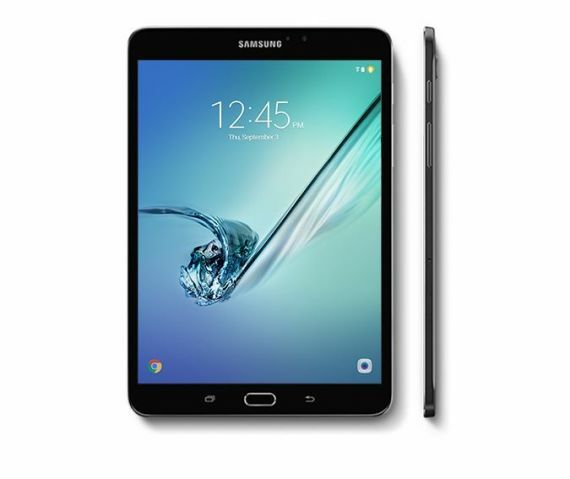 Although the Samsung Galaxy Tab S3 9.7 uses almost similar design like its predecessor, this Samsung tablet proves more comfortable to hold. In terms of both look and feel, the new glass back panel does make a huge difference. At first glance, the Samsung Galaxy Tab S3 9.7 resembles more like a magnified version of Samsung Galaxy S7 smartphone. Thanks to its elegantly designed metal and glass tablet, Samsung Galaxy Tab S3 9.7 looks more premium than its older sibling. At just 6mm, it is amazingly thin. 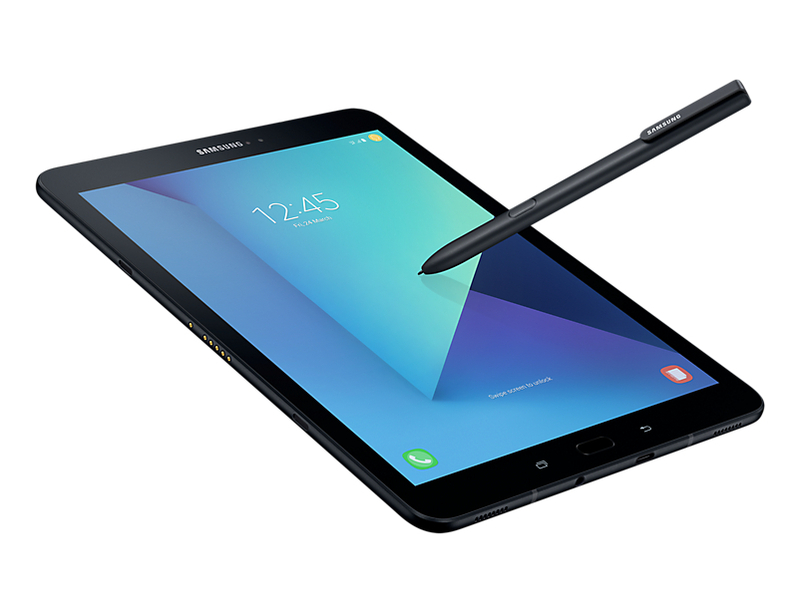 When you take a look at its overall design, Samsung Galaxy Tab S3 9.7 boasts a level of sophistication that sets it apart from other tablets. Over the years, Samsung develops its own distinctiveness in an oversaturated market which is full of look-alike designs. On its right side, you will find the power button, volume rocker, and microSD card slot. As expected, you can see the USB Type-C port and headphone jack at the bottom. On the left side, you get a port to connect with your optional keyboard. Once again, this Samsung tablet revives the tradition of a physical home button (fingerprint scanner as well) which was abandoned in the new Samsung Galaxy S8. For a start, the Samsung Galaxy Tab S3 9.7 flaunts its 9.7-inch display screen (2048 x 1536 resolution) with 4 : 3 aspect ratio. While it enjoys the usual Super AMOLED display technology, it now supports HDR (High Dynamic Range). This HDR enables Samsung Galaxy Tab S3 to exhibit better colours and contrasts. You will see the difference when you notice increased the visibility of darker movie scenes. 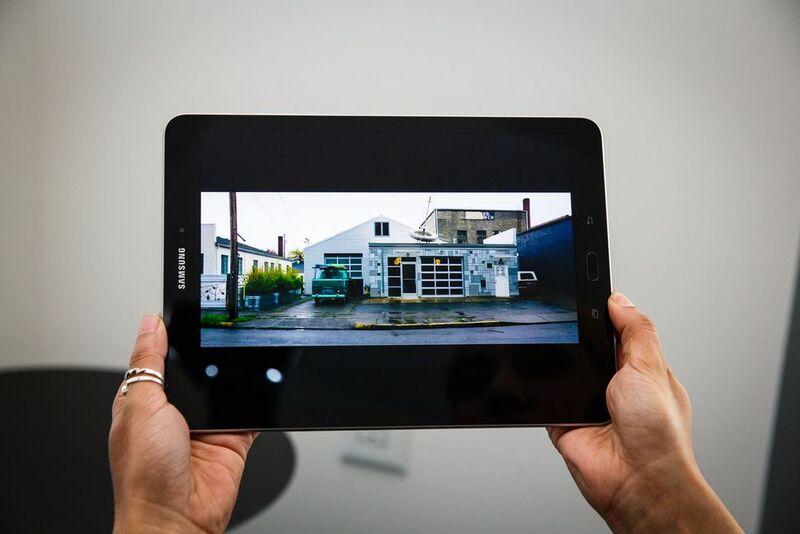 Most importantly, HDR support makes this Samsung tablet future-proof because you now have world's first HDR-ready tablet to enjoy certain HDR video content on Amazon Prime Video and Netflix. 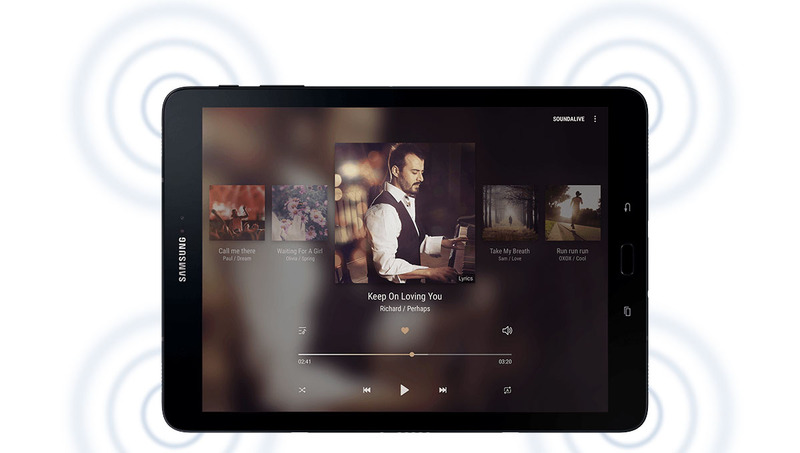 When it comes to audio performance, Samsung Galaxy Tab S3 9.7 delivers loud and immersive audio quality with its quad speakers. Instead of the usual mono-speaker tablet designs, quad speakers can reach a volume of higher capacity. More impressively, its quad speakers are calibrated to your movements so that you will never hold your tablet the wrong way while listening to audio. Such audio quality alone has enabled it to stand ear-to-ear with Apple iPad Pro 9.7. In order to unlock its 2-in-1 potential, you have its newer S Pen design that is larger than the S Pen in other Samsung designs. First, the stylus design has two flatter sides and a clip so that it does not roll away unnecessarily. Another good news about this new S Pen design is that you do not have to charge it. Since it is larger, it easier and more comfortable to hold. As a result, you will have a natural writing and drawing experience. 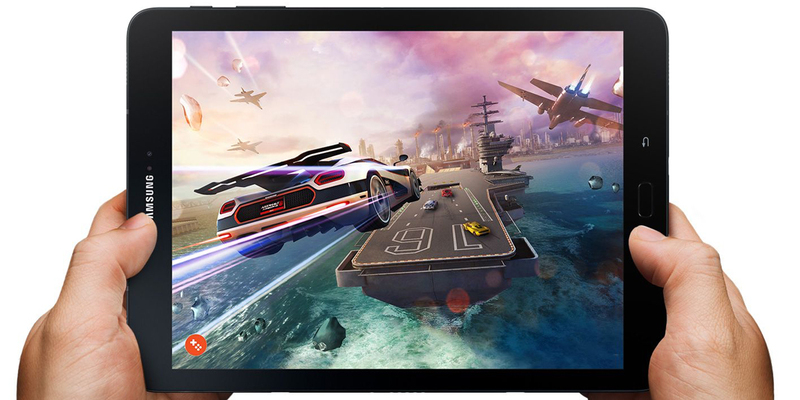 At the heart of the Samsung Galaxy Tab S3 9.7, you will discover the Qualcomm Snapdragon 820 which is powerful enough to run all the latest 3D games. Furthermore, it will remain compatible with newer titles in the long run. Impressively smooth, this chipset actually comes from last year. It still is up to the job because it is perfectly capable of running demanding apps while offers the ability to use two side-by-side via Multi-Window. In terms of storage, it uses 4GB of RAM and 32GB of internal storage. If needed, you can expand up to 256GB with the MicroSD card slot. 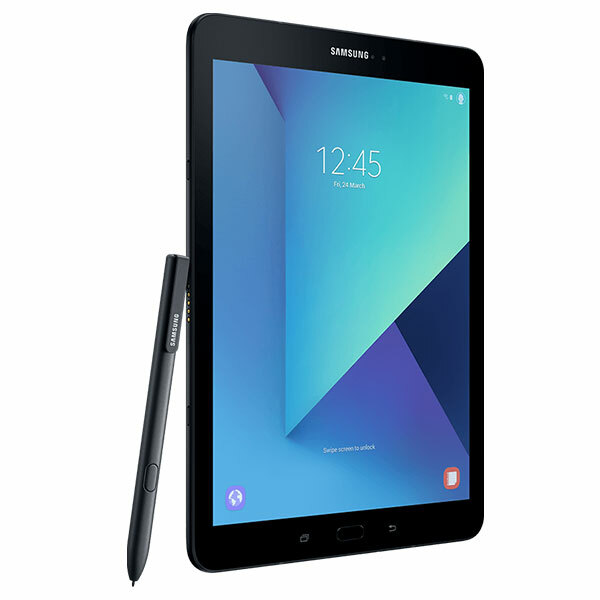 Housing a 6000mAh battery, the Samsung Galaxy Tab S3 9.7 will give 12 hours of video playback. On standby, it can hold the charge well. Thanks to its USB Type-C, you can reach full recharge in just two and a half hours (you can get up to 23% in just 30 minutes). While its 6000mAh battery is still underwhelming as compared to the Apple iPad Pro 9.7 (7300mAh) and the Google Pixel C (9200mAh), it still boasts above-average battery life. 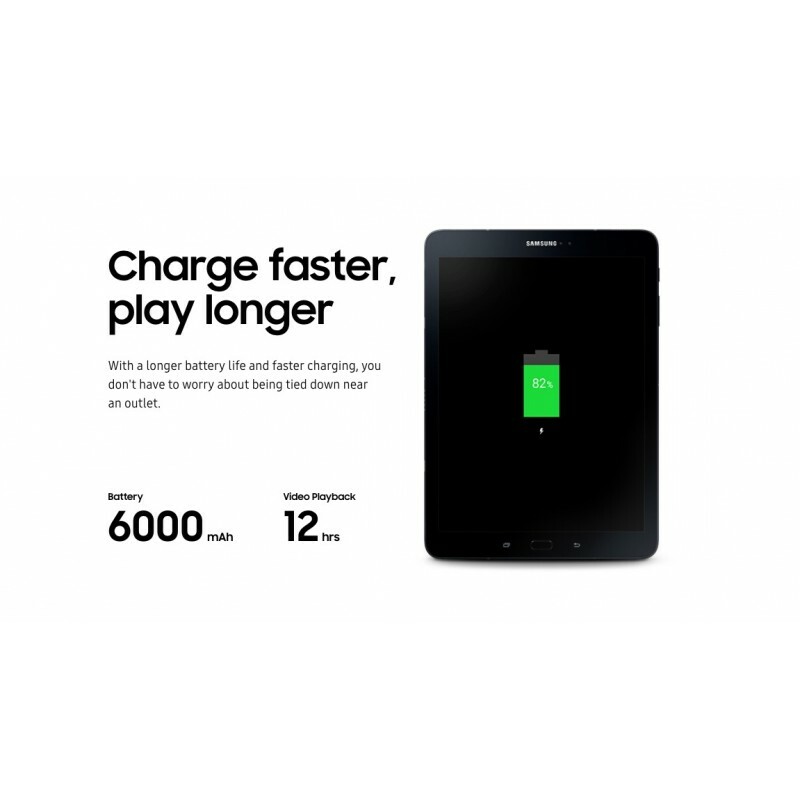 When you activate its Battery Saver Mode, your Samsung tablet can last longer. If you are preparing for a long-haul flight or commute, it still more than sufficient to power your work or entertainment. The Samsung Galaxy Tab S3 9.7 is the likely result when you let Apple iPad Pro run Android; an analogy that most reviewers agree. It is the best option available if you require a powerful tablet that runs on Android. Since it already comes with S Pen, it offers better value than the Apple iPad Pro. For all tablet users and aspiring users out there, you can now own aSamsung Galaxy Tab S3 9.7 at the lowest price in Singapore.